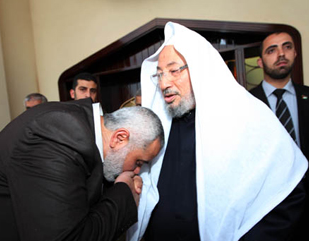 May 9, 2013 Leading Muslim cleric Shaikh Youssef Qaradawi paid a high-profile visit to Gaza on Thursday, giving a boost to the Islamist group Hamas that runs the enclave, but also laying bare Palestinian rivalries. ‘Our wish should be that we carry out Jihad to death,’ said Qaradawi, who has gained a large following in the Muslim world thanks to regular appearances on Al Jazeera television. ‘We should seek to liberate Palestine, all of Palestine, inch by inch,’ he said, backing the position of Hamas, which refuses to recognise Israel’s right to exist. An Arab language report says that Qaradawi was accompanied by a delegation of 40 people from several countries, including Egypt, Qatar, Saudi, Syria, Australia and Britain. Pictured with Qaradawi is Abdul Rahman Siwar Al-Dhahab, former Sudanese President and Deputy Head of the Union of Good (UOG).